Infrared images from NASA's Mars Odyssey orbiter show how the dust storm is blocking sunlight to the planet's surface. Opacity decreases from left to right on the scale bar. The purple areas are nearly clear, while the red regions show roughly a two-thirds reduction in sunlight. The enormous dust storm raging across Mars’ southern half has begun to creep into the northern hemisphere as well, new satellite images reveal. 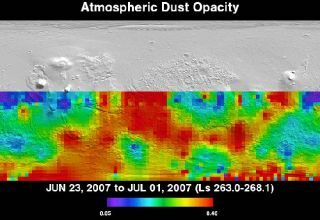 Scientists are using the Thermal Emission Imaging System (THEMIS) on NASA’s Mars Odyssey orbiter to track the global Martian dust storm that erupted suddenly in late June. THEMIS is a multiwave camera sensitive to multiple wavelengths of both visible and infrared light. The dust storm began in Mars’ heavily cratered southern hemisphere and swelled to encircle the entire planet in roughly a week. As winds swept dust into the atmosphere, the atmosphere warmed, creating a positive feedback that added to the storm’s power, helping it pick up even more dust. But this process can only go on for so long. “When the dust becomes thick enough, it reflects more sunlight from the atmosphere, allowing the air near the surface to cool,” said Joshua Bandfield, research associate at the Mars Space Flight Facility at Arizona State University. If severe enough, dust storms can entirely obscure surface features on Mars. The first images from NASA of the storm reveal it hasn’t reached this level yet, although it has kicked up enough dust to reduce solar power to two robotic rovers, Opportunity and Spirit, currently on Mars. It’s uncertain how long the current storm will last, but it probably won’t disappear as quickly as it began. “Mars will remain dusty for at least a couple more months,” Bandfield predicts.